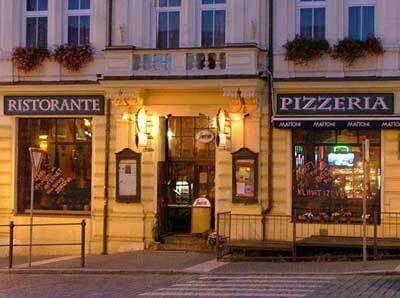 The Pizzeria opposite the tourist information office on the main square of Turnov is a good place for a coffee, an evening drink, or a meal. They also offer a good wi-fi internet service for free to their customers. The location on the ground floor of Turnov's Hotel Korunní Princ could hardly be more convenient. The big plate glass windows at the front offer views across the square but the locals' favoured seats seem to be those lining the side wall. There's space for about 70 people altogether, but all the seating is in booths, and the benches are just the right height to provide privacy and divide up the room without making it seem too crowded. The seats are all covered in deep green, buttoned upholstery. Dark wooden panels line the lower part of the walls and the upper part and the ceiling are all painted in deep mottled terracotta. The effect is warm and cosy and it must be a lovely spot to retreat to in the winter. Non-smokers though mightn't appreciate it quite so much. It seems to be a popular place for people just to sit and drink. And smoke. At least that's in the evening. I noticed it was better during the day and the staff seemed quite happy to have people just call in for a cup of coffee and a slice of one of their cakes, which are displayed in a glass case beside the entrance door (you'll need to go up to choose). The coffee is quite well made and goes for 28Kč for a large espresso with milk. The free wi-fi service is easy to use and worked for me with no problems. You'll need to ask for the password the first time you connect, but once that's done you're in business. 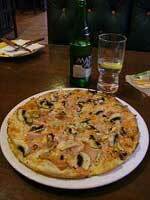 I visited a couple of times for coffee and cake and on my last night in Turnov had a pizza for dinner. I chose the ham and mushroom pizza and it was excellent. Best pizza I'd had for a long time, actually. And it was only 99Kč, which I thought was very good value. The other pizzas ranged from 99-129Kč and the pastas started at 79Kč. My mineral water was 25Kč and a cup of coffee with a slice of cake will set you back 55-60Kč. If you'd rather have beer, the 10 degree Gambrinus was 22Kč per half litre and the 12 degree Pilsner was 28Kč. (September 2008 prices). There's a decent selection of local and imported wines and whiskies, hot and cold non-alcoholic drinks and you can even buy a single cigarette if you so desire. The only thing they don't seem to do is breakfast. The Korunni Princ Pizzeria is open seven days a week from 11am until 11pm, except on the weekends, when they close at midnight. I'm sure I'll be in there at least once next time I'm in Turnov, which is more than I can say for the other places I ate.